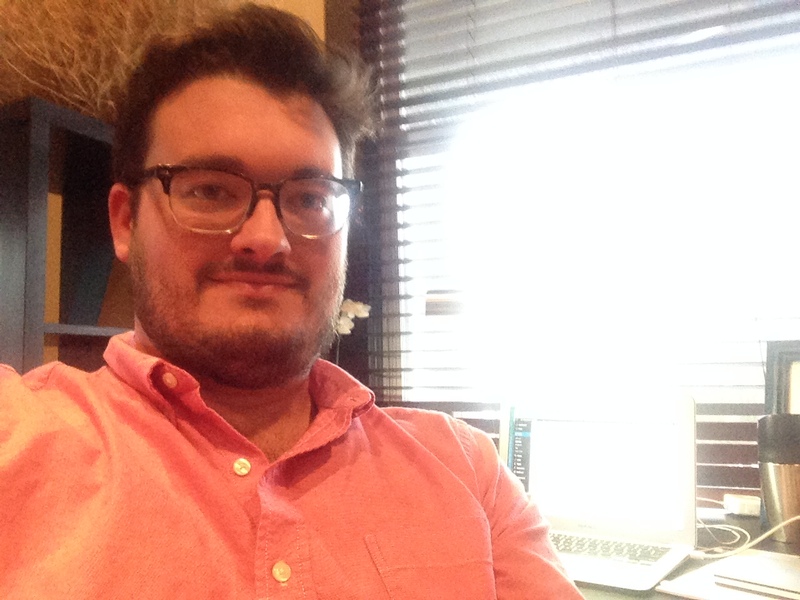 Me sitting in my awesome new office (with that super cool window seat) as I post. At the beginning of the summer April and I decided to start a series called Mississippi Mondays, which would cover things we love about this beautiful, backwards state (things that are so often overlooked due to the bad behavior of our loudest and elected citizenry). I thought a post about the 50th anniversary of the Freedom Summer would be a great start. I started a new job today and I’ve been in the middle of a pretty busy transition period so I have neglected my Mississippi Freedom Summer research. I have, however, been thinking a lot about an experience I had last fall that speaks for how far we have come since–and because of–that summer. I will briefly summarize the Freedom Summer for context. In 1964, more than 1,000 volunteers–mostly northern whites–were bused into Mississippi to work alongside black Mississippians to help black Mississippi adults register to vote. The volunteers and Mississippians alike were met with much violence in response to their participation in the registration drive. The summer garnered more public attention than votes, especially after James Chaney, Andrew Goodman and Michael Schwerner were killed in late June. Many of the men implicated in the killings never received real justice and it wasn’t until 2005 that Edgar Ray Killen, a pastor and the mastermind behind the killings, was tried and convicted for the crimes. Fast-forward 50 years and Mississippi is still a state known nationally for poor race relations, something I can’t defend. But, I can offer some anecdotal evidence of incremental change. April and I participate in Big Brothers, Big Sisters. If you haven’t considered connecting with your local chapter, you should. It’s the most rewarding experience of our marriage thus far. We were paired with a little brother, Rickiea, and after a year-and-a-half consider ourselves less a part of the program and him more a part of the family. He’s my favorite dude. 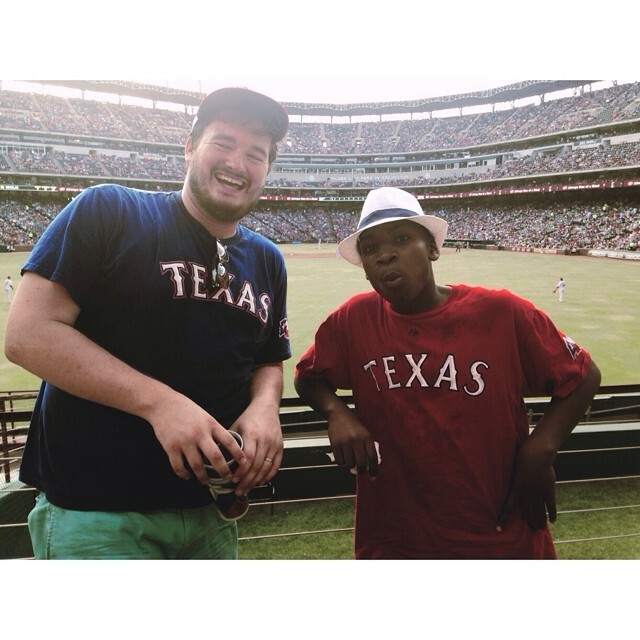 Rickiea and I at a Texas Rangers game this summer. My family went to a Halloween party this past fall and Rickiea came along. We got him a grim reaper costume because we were told other kids would be wearing costumes but once we arrived everyone was wearing jeans. After a quick costume change we hopped out and joined the party. Rickiea has a pretty big personality so he was immediately recruited into the roving band of children and disappeared. The party was at a friend’s house in the middle of nowhere in Pontotoc County (read: country). Rickiea and I went on a hayride together with a bunch of other kids and adults. We sat down in the trailer and started talking. I was trying to get him scared before we took off into the woods and he was trying to get me to shut up. We rarely bring up race when we talk with Rickiea, unless we’re talking about something that warrants a discussion of race (like the Freedom Summer). In Mississippi, when two people of different races are together, race comes up and it becomes the focal point of the conversation. Not every time, but about as often as the weather gets brought up. We don’t think race shouldn’t be talked about it, and we haven’t created some policy on racial conversations, we just prefer to treat everyone like humans and family in the moment. That being said, it’s important to know Rickiea was one of two black people at the party. The other was an adult who worked in the host’s catering business. “Yea,” we answered in unison. “Cool,” she said, without giving it a second thought. We talked a little more about what we expected from the haunted hayride and gave no further thought to Rickiea and my relationship. This was a simple moment and really meant nothing to the two children involved but it meant so much to me. When I was a kid that short conversation would have never happened without a second thought. It would have been followed by a debate and a parent intervening and possibly some controversy about interracial families. That night we left it at brothers. And that’s what we are; we’re brothers. That moment would have never happened if not for all the wonderful and painful Civil Rights work in our state over the past 50 years. I think about it once a week. Rickiea probably hasn’t thought about it since. That means he lives in a Mississippi where he has gone 13 years without having too many people tell him that he can’t be family with people who look different from him.